“Tie-in has a whole extra level of stuff to get right,” Narry told me today. And he’s right. I got the beta review back on a story I was preparing. While I feel the tale has some strong themes and solid action going for it, there were a handful of technical issues that need addressing. And there were a few other elements that need better delivery in order to stay true to the background. Best guess, it’ll take an hour of work to get right. Another hour to correct the synopsis and probably 30 minutes to an hour to revisit the cover letter. Meanwhile, my conscience continues to Navi me over the novel. I haven’t touched it since the turn of the month, returning to the standard 1,000 words a day rate of my short story speed. I’ll be certain to return to it this week at some point, but as I’m so close to being ready on this story, it’ll be easier to finish it and have it ready. 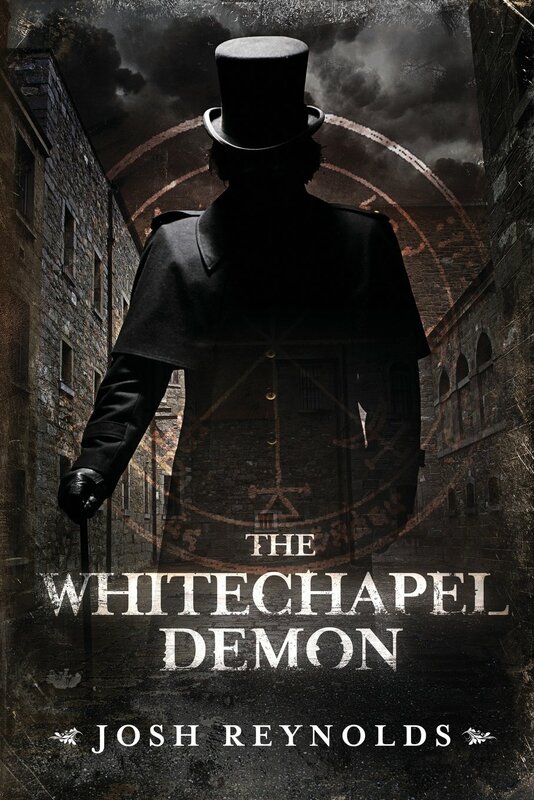 The Whitechapel Demon by Josh Reynolds. Over the weekend, I finished The Whitechapel Demon by Josh Reynolds. The book is the first of an upcoming series involving the duties of a figure entitled the Royal Occultist. Appointed by the queen, it is the duty of the occultist to investigate all strange and macabre incidents throughout England. The current holder of the title (there have been several before, giving Reynold’s work a rich background to draw from) is a Mister Charles St. Cyprian, a veteran of the Great War. St. Cyprian is not alone throughout his efforts, as he works with his assistant Ebe Gallowglass, and both competes and cooperates with the Ministry of Esoteric Observation, his bureaucratic rival. Mister Reynolds has certainly done his homework. Although I’ve yet to fully research it, many of his elements come from real world sources and references, such as Jack the Ripper, Aleister Crowley, hyssop oil, ectoplasm and pentagrams. Although fiction, the big draw of the Royal Occultist is its reverence to historically-attempted applications of magic. The book is a treat for anyone who loves Sherlock Holmes, the occult, The X-Files or perhaps Constantine. Or better yet, any and all of these blended into one. Although the novel is relatively short at less than 180 pages, its brevity helps the reader decide whether or not the forthcoming series will be for them, a wonderful change from the 600 page novels that begin too many fantasy series. The latest episode of Halt and Catch Fire was the best yet. Hands down. Perhaps the reason I like it so much is due to how it has stopped being so prudent. The pilot was great and set the stage perfectly, then the follow up episodes slowed it down a little, holding back the tide of plot. But as of the sixth episode, they changed course and let the chips fall where they may. Exactly how it should be. On paper, the show seems to have a lot of similarities with Mad Men. There’s direct client interactions, a historical basis, the focus remains business drama, and a great deal of personal character dilemmas and conflicts. But in execution, the show has a faster pace, more sudden turns and borrows themes from David Fincher’s The Social Network. What I like the most is the difference in how the two shows handle foreshadowing. Mad Men sticks to its tried and true subtle method of hinting the future. But while Halt and Catch Fire flirted with that, they eventually gave up and went bold. That is the ideal for a show about a revolution, with its characters persistently pushed to the edge and recovering with an ever weakening grip. Which brings us to the awesome scene from “Landfall” where Gordon runs about the city, desperately trying to buy a Cabbage Patch doll for his children before a hurricane strikes. After being swindled out of $80 by a conman offering a wrapped box with a stone, Gordon finally comes to a toy store and finds it closed due to the storm. But while returning to the car, Gordon spots the doll on display in the window. Frustrated with seeing the prize taunt him, he takes (what I believe) is the stone from his conning and smashes the display. But before he returns, he hears something about the building and finds a body who eerily looks like his boss Joe MacMillan. I don’t know whether the body was real or a hallucination. Gordon was who saw it. But the question is, was it foreshadowing, or was it simply a manifestation of his fears? Of the three main characters, Cameron has barely applied effort to anything in her life, and to our knowledge Joe has never failed. But Gordon, uniquely, has done both these things when he created and failed to market the Symphonic. I feel this vision, real or not, will add to Gordon’s conservative sense and turn him into a greater obstacle for Cameron and Joe. And given his experiences, it’s a shame they probably won’t listen.